In the previous two blog posts I’ve explained how to implement Exchange Online Protection as a message hygiene solution for your on-premises Exchange environment, both for inbound as well as outbound mail flow. When Exchange Online Protection is fully up-and-running you can continue configuring SPF, DKIM and DMARC for message authentication purposes. This will make sure your email domain is much harder to spoof and receiving email systems know that the source of your email is a trusted source. SPF has been around for years, and in my previous blog post I already mentioned the SPF record needed for use with Exchange Online Protection. If you want to read more about implementing SPF, please check my SenderID, SPF, DKIM and DMARC in Exchange 2016 – Part I blog post. When only using Exchange Online Protection your SPF record will look like v=spf1 include:spf.protection.outlook.com -all. The good thing about Exchange Online Protection is that it supports DKIM signing and verification out of the box. The only thing you have to do is enable it in the Exchange Admin Center! Logon to the Exchange (Online Protection) Admin Center, select protection in the navigation menu and click DKIM in the toolbar. When you click enable, an error message (in yellow) is shown that you need to create the appropriate DNS records first (click to enlarge). For more information regarding DKIM and Exchange, please check my SenderID, SPF, DKIM and DMARC in Exchange 2016 – Part II blogpost. The RUA is an email address where DMARC reports are sent to, so it’s a good thing to have such a mailbox on your Exchange server. Everything is configured correctly now and spoofing is much harder to achieve for malicious users. For more information regarding DMARC and Exchange, please check my SenderID, SPF, DKIM and DMARC in Exchange 2016 – Part III blog post. 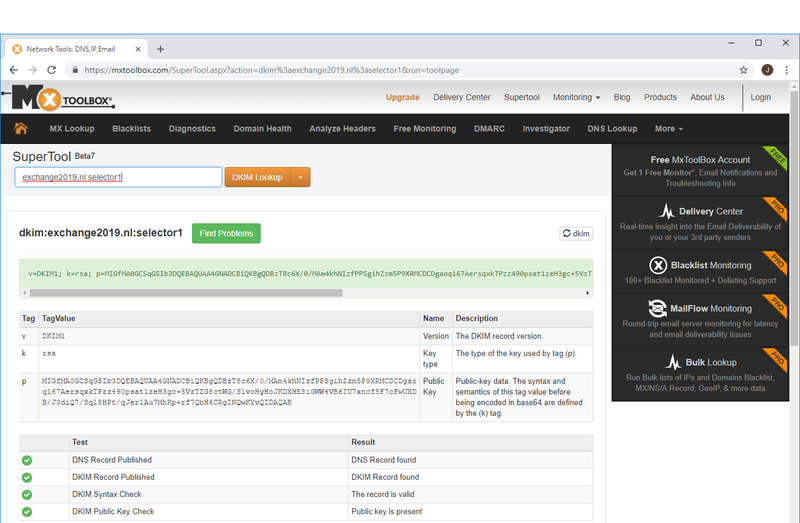 In this blogpost I showed you how to configure SPF, DKIM and DMARC in Exchange Online Protection to prevent spoofing by malicious users. In my next blog I’ll go more into detail about configuring the message hygiene options themselves in Exchange Online Protection. 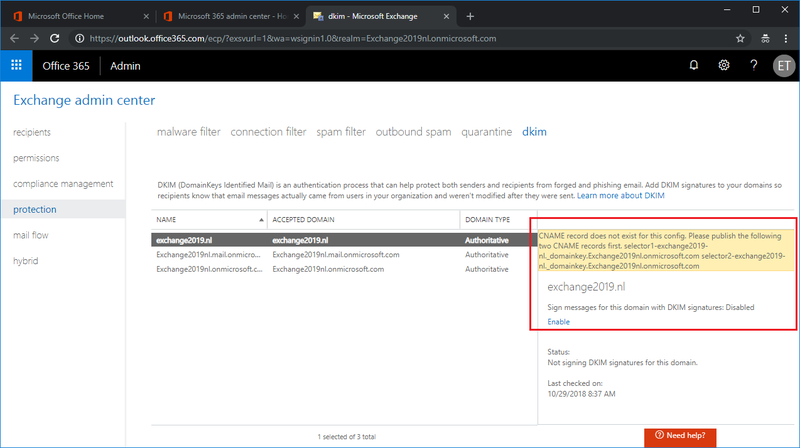 In the previous two blogpost I discussed how to configure SPF, DKIM and DMARC for outbound messages using the TrendMicro Hosted Email Security solution, including Office 365 centralized mail transport. In this blog I’ll discuss SPF, DKIM and DMARC for inbound messages (i.e. the verification part) using the TrendMicro solution. For inbound protection there’s not too much configuration to do, the only thing when using an online service is enabling the services. In my previous blog I showed you how I implemented Trend Micro Hosted Email Security (HES) in my Exchange 2010 environment. Interesting case, it’s an Exchange 2010 hybrid environment with mailboxes in on-premises Exchange 2010 as well as mailboxes in Exchange Online. 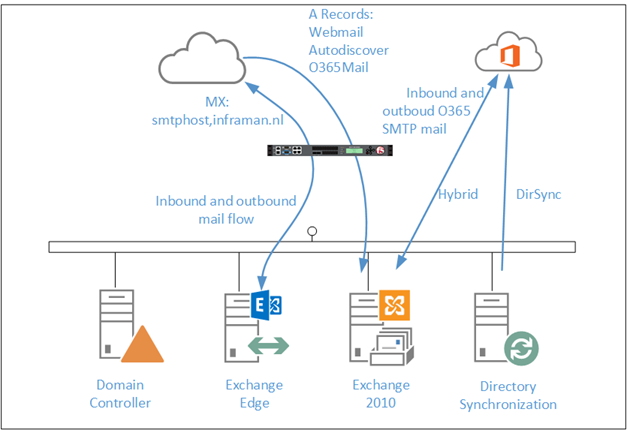 Centralized mail transport is used, so mail to and from Office 365 always routes via HES and the on-premises Exchange 2010 servers to Exchange Online. 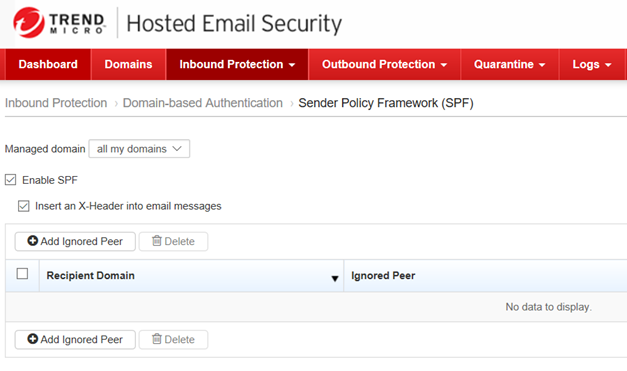 In this blog I will focus on implementing SPF, DKIM and DMARC in Trend Micro Hosted Email Security. SPF in itself is covered in more detail in a previous blog post “SenderID, SPF, DKIM and DMARC in Exchange 2016 – Part I” which can be found here: https://jaapwesselius.com/2016/08/19/senderid-spf-dkim-and-dmarc-in-exchange-2016-part-i/. DKIM is about signing header information using a private key, and to decipher the signature you need a public key which is stored in public DNS, accessible for every mail server on the Internet. No need to worry about the configuration, HES will deliver all the details. In the HES console select Outbound Protection and select DomainKeys Identified Mail (DKIM) Signing. Microsoft has implemented DKIM, DMARC and SPF in Exchange Online, the only thing you have to do is enable it. The only thing for DKIM you have to do is create two CNAME records in DNS and enable DKIM in the Exchange Admin Center. Selector1 and selector 2 are the 2 selector tags (in Office 365 these will always be selector1 and selector2), the _domainkey is a default tag that will be added. Of course you have to replace the contoso.com with your own domain.